I am so sorry for all the radio silence the last year. 2017 was full of lots of changes, stress, and super hectic schedules. Here's hoping 2018 will be better! I will catch up on posting the last 6 months of work as soon as I can. Littlepip is of my own 15" mare pattern and is made from Shannon minky fabrics. 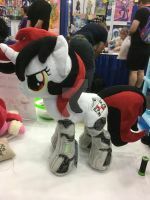 She has machine embroidered eyes, cutie marks, and artist tag on her rear. Her hooves are filled with poly pellets so she stands flat and firm. Her face details are hand embroidered and her barding is removable and made of minky with a zipper. She was a commission and not for sale! Commissions are currently OPEN! I work in the order paid. Follow me on Twitter, Tumblr, and Instagram! "Emberfallplush"